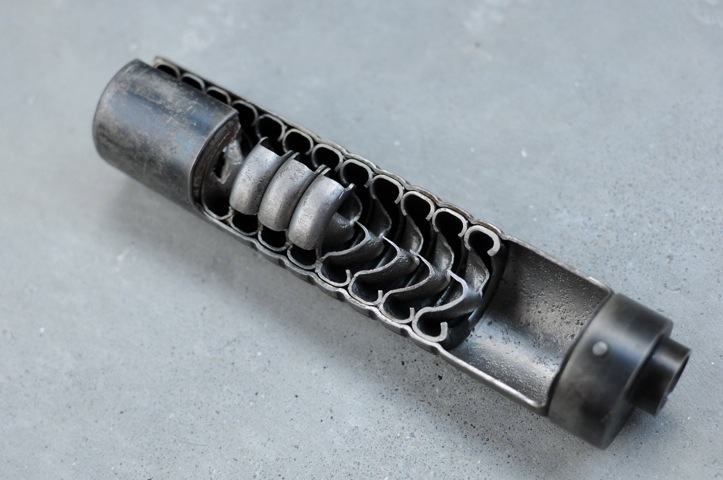 This interpretation is what spawned the blog post “Did ATF’s Determination on NICS Checks Open the Door for Manufacture of New Machineguns for Trusts” by Chief Counsel Joshua Prince. And as we all know, the NFA Examiners issued a number of approved Form 1s before they had to recall them due to an “error”. Since this letter was published, a number of FFLs either on their own accord or through advice of counsel have begun to perform background checks when transferring NFA Firearms to trustees. But is this actually required? So what’s the big deal you ask? There are a few different issues that need to be addressed. First, does the GCA of 1968 even APPLY to trusts? As Section 921(a)(1) does not define the term “person” to include an unincorporated trust, there is nothing in the GCA to indicate a trust falls under its purview! As Chief Counsel Joshua Prince pointed out to me in our discussions on this topic, ATF has said that a trust cannot hold an FFL because trusts, by definition, are not a person under the GCA and thus do not fall into the purview of 18 U.S.C. § 923. Yet, in the same breath, ATF is stating that trustees need to have a background check performed when they pick up a NFA item! How is it that ATF can refuse an FFL to a trust, because it is not a person under the GCA and refuse to pierce through the trust to an actual person, while requiring an FFL to, in essence, pierce through the trust to perform a background check for an NFA item? It would seem that ATF is directing at least one FFL to perform a background check that I can find no legal requirement to perform. To my knowledge there has not been an industry wide newsletter or open letter directing that FFLs perform such a check. And even if there were, there is nothing I can find in the law to suggest that it is actually required. In a 2008 newsletter to FFLs, ATF addressed the transfer of a National Firearms Act firearm to a corporation or other legal entity. Form 4473, Firearms Transaction Record, must be completed by the representative of the corporation or other entity. (a) FFLs may initiate a NICS background check only in connection with a proposed firearm transfer as required by the Brady Act. FFLs are strictly prohibited from initiating a NICS background check for any other purpose. The Brady Act amended § 922 along with a few other sections of Chapter 44. If the Attorney General approved the transfer under Section 5812 of the Internal Revenue Code then no NICS check is required. But the devil is in the details. We are talking about a transfer from a licensee to a person and a trust is not a person as defined in 18 U.S.C. § 921. Since the licensed dealer isn’t transferring the firearm to a person, how could the GCA apply at all? Furthermore, why does it matter that the trustee or person acting on behalf of the trust is not the approved transferee under 26 U.S.C. § 5812? What makes them so special that they need a NICS check performed? A person who comes in to pick up a NFA firearm on behalf of a corporation or a LLC isn’t the approved transferee. Yet, ATF doesn’t seem to have any qualms about that individual picking up a NFA firearm without a NICS check under the 18 U.S.C. § 922(t)(3)(B) exemption. Moreover, 28 C.F.R. § 25.6 prohibits FFLS from utilizing the NICS system for any other purpose than required by the Brady Act. Ostensibly, FFLs cannot comply with what ATF purportedly wants them to do; access NICS to perform a background check on a Trustee picking up a NFA firearm. 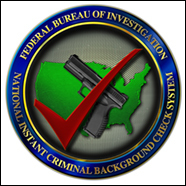 Utilizing the NICS system for purposes other than allowed by Subpart A of the National Instant Criminal Background Check System as defined by 28 C.F.R. §§ 25.1-25.11 shall result in a fine not to exceed $10,000 and the possible cancellation of NICS inquiry privileges. Which can more or less be read as the loss of ability to conduct business as a FFL, if it is canceled. Even if the NICS query would not be illegal to perform, there is another issue under Pennsylvania law! 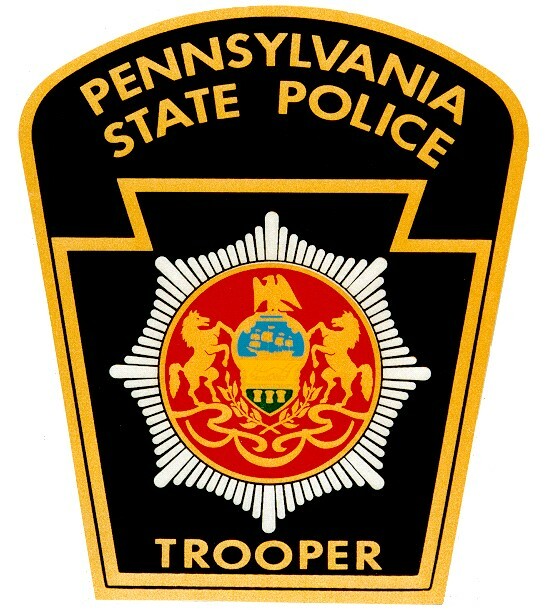 As you are probably aware, the Pennsylvania State Police act as a point of contact for the NICS system. However, Pennsylvania law only allows for limited uses of the PICS system. These uses are defined in 18 Pa.C.S. § 6111. (3) Requested by means of a telephone call that the Pennsylvania State Police conduct a criminal history, juvenile delinquency history and a mental health record check. (5) Issued a receipt containing the information from paragraph (4), including the unique approval number of the purchaser…. For the purposes of this section only … “firearm” shall mean any weapon which is designed to or may readily be converted to expel any projectile by the action of an explosive or the frame or receiver of any such weapon. Even with the expanded definition of firearm for the purposes of this section, a silencer does not fit into the criteria spelled out by the General Assembly! Any … licensed dealer … who knowingly and intentionally requests a criminal history, juvenile delinquency or mental health record check or other confidential information from the Pennsylvania State Police under this chapter for any purpose other than compliance with this chapter … commits a felony of the third degree. Even if FFLs could contact NICS to perform a background check on a trustee when delivering a NFA Firearm without abusing the system, a Pennsylvania FFL will be committing a felony of the third degree under state law! FFLs who are conducting background checks on trustees due to their interpretation of the Dakota Silencer letter or legal advice they received may wish to inquire with their counsel as to whether or not they actually need to perform one. There does not appear to be any basis in the law for such a requirement. Section 921 does not include an unincorporated trust in the definition of a “person” and the Attorney General would have approved the transfer under 26 U.S.C.A. § 5812 to the trust! As there have been some emails and comments on this post, it is appropriate to update it so there is no confusion. In PA and from what I understand, several other states, the definition of a firearm does not include a silencer. However, in PA SBRs, SBSs, Machine Guns and AOWs would require a FFL to conduct a PICS check as the definition of firearm would include those items. I apologize if anyone was misled. This was strictly in the context of a silencer. As always, consult with your legal counsel before making any decisions. Did you find this blog article informative? Be sure to share it with your friends by clicking the buttons below. If you haven’t already, make sure to like both Prince Law Offices and Firearms Industry Consulting Group on Facebook using the buttons to the right! I have had multiple nics checks done on me by my SOT for all my suppressors. You may want to forward this to your SOT and tell them they may want to ask their legal counsel (if they have any) whether they are required to. State police require it in VA. The language at the bottom of the letter stating that the information was provided with guidance from the FBI Office of General Counsel, ATF and VSP Legal is interesting. check is required, instruction is provided in the third paragraph of the memorandum from Captain Turner. If an NFA firearm is federally registered with an approved ATF Form 4 (Application for Tax Paid and Registration of Firearm), then no NICS check nor SP65 is required. Is this correct? Do you have the memorandum from Captain Turner available? Actually reading the letter VSP sent, first sentence in the second paragraph, “..if the NFA weapon is federally registered, a NICS check is not required.” Seems pretty clear to me. The second sentence in the second paragraph is irrelevent since it says “…in Trust in lieu of registration…” But, if the NFA firearm isn’t registered, i.e.. on a Form 2, 3, 4 or 5, then it is contraband and illegal to possess if I’m not mistaken. 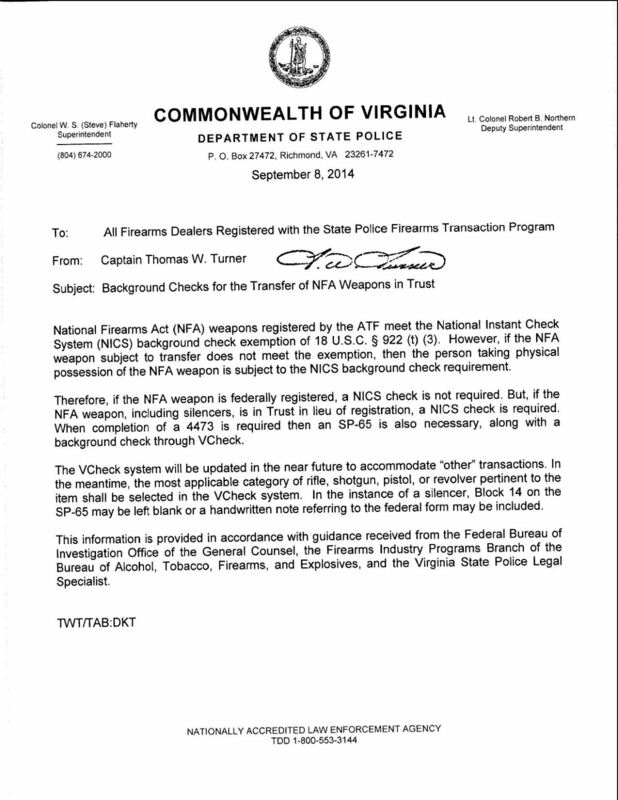 However, Virginia does require a background check for all firearms as defined in the Virginia Code. Fortunately, Virginia doesn’t define suppressors as firearms. It’s the letter David posted above. Pardon me, I forgot that was posted there. You are correct in your analysis on the lack of a form making it contraband (presuming its not registered to that individual in the NFRTR). PA is like VA in that regard. A silencer is not a firearm here either. Pingback: Roses are Red, Violets are Blue, You’re a Trustee, So No Background Check For You! | Prince Law Offices, P.C.